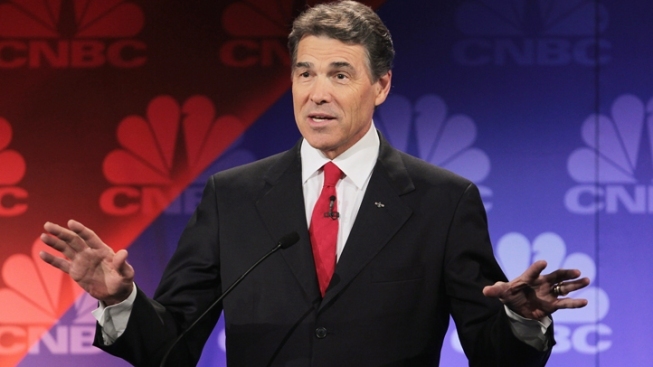 Rick Perry compared himself to Tim Tebow at a recent debate — but Jay Leno has another comparison in mind. Rick Perry might be losing ground in the GOP primary race, but he sure isn't losing any ground in late night jokes. The one-time front-runner for the Republican nomination has suffered in the polls thanks to his now-legion forgetfulness — but it's just that quality that landed him in Jay Leno's opening monologue again on "The Tonight Show" Tuesday. Leno questioned the comparison Perry recently drew between himself and the Denver Broncos' quarterback Tim Tebow, who has a habit of genuflecting in prayer mid-game. "See, when Rick Perry gets down on one knee, he's trying to remember how to tie his shoe," Leno joked. "Last night, in a pre-season game, the Clippers wiped out the Lakers 114-95. That's like Rick Perry beating Alex Trebek in 'Jeopardy!'" See a clip from the monologue below.